Siggy Baker - Ponyville Live! 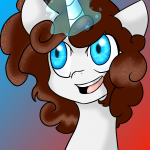 I'm best known for my ability to draw ponies, my mainlines are Tumblr and DeviantART. I do a lot of live streams as well, to help show off my art and stuff, Sometimes I play games on them and commentate. I also love to help out with other peoples' projects, say someone needs some art to help advertise something- I'd be glad to do help out any way I can! I love me some Small Horses.